This disc offers a varied showcase for the talents of a phenomenal player. 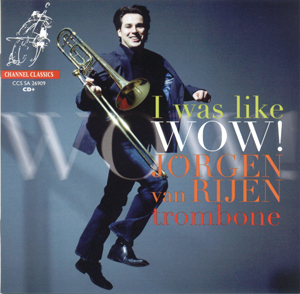 Jörgen van Rijen is the principal trombone of the Concertgebouw, but in recent years has also become a soloist of international standing. His tone is broad and strident, but there is also enough variety there to cover the spectrum from the militaristic to the lyrical. On the whole, this programme tends towards the latter. Apart from the title track, which concludes the CD, the main works are all familiar staples of the solo trombone repertoire. But of those three, the Martin, the Castérède and the Gaubert, two are in less familiar arrangements. Frank Martin’s Ballade, was originally written for trombone and piano but is better known in the later orchestrated version. If the original sounds a little flat in comparison, that’s certainly not the players’ fault. But the hairpinned swells in the strings at the opening, for example, are notable by their absence. Van Rijen makes up to a certain extent with the variety and lyricism of his performance. Paolo Giacometti offers both lyricism and drama, both here and elsewhere on the disc. The unusual feature of Jaques Castérède’s Concertino as presented here is the inclusion of a trumpet. Frits Damrow is the principal trumpet of the Concertgebouw, and easily matches van Rijen’s virtuosity, but without stealing the show. Apparently, the addition of the trumpet to this trombone and piano work was an afterthought on the composer’s part and a solution to the congested textures in the accompaniment. Freed of this extra thread of counterpoint, Giacometti provides a muscular accompaniment that easily balances the heavyweight soloists. The style of work approaches Poulenc, a rich mix of the lyrical and the dramatic in a framework that is only ever a short step from neoclassicism. The Gaubert’s Morceau Symphonique is the one standard work that is presented in a standard form. Or rather not, in that it is famous as an audition and examination piece, but would rarely be heard in either of those contexts performed to this standard. Van Rijen brings the sound of an orchestra section principal to his solo work. The technical resources he can draw on are phenomenal. I’m particularly impressed by the broad, round tone he often has in the very highest register – that’s ideal for Schumann 3, but you wouldn’t hear it from Christian Lindberg. Having said that, van Rijen shares Lindberg’s taste for narrow but definite vibrato and also his ability to produce smooth lyrical lines in any register or tempo. One of his secrets when it comes to legato, I think, is the acoustic. All the works on the disc were recorded in churches in Amsterdam. I get the impression from the sound that the churches are quite small, but impressively resonant. The clarity and length of the decay allows the notes to blend together when required, and in combination with the SACD sound creates a satisfying feeling of aural immersion. On the other hand, there is something a little artificial about it too, or rather claustrophobic, as if the acoustic has been selected solely to showcase the surround sound. The piano in particular sounds very strange. It is recorded from a distance, I think, to accentuate the effect, but it is unthinkable that anybody would try to record a solo piano recital this way. Of the less familiar works, the biggest surprise (for me at any rate) is an aria by Mozart with trombone obligato. This work is completely new to me, but is a major contribution to the trombone repertoire. It seems we have Luther’s deficient organology to thank for the trombone part; the 11-year-old composer used the instrument for the aria because his Lutheran bible refers to the last trumpet of Judgement Day (the subject of the text) as Posaunenschall. Van Rijen is joined in his warm bath of an acoustic by tenor Marcel Beekman and the period ensemble Combattimento Consort. He uses a sackbut for the work, but unless you’d read that in the liner, you’d never know. Similarities again with Lindberg, whose recent sackbut disc sounds just like his tone on the modern trombone. I suspect that both players have retained their modern mouthpieces for the sake of their lip. Unfortunately, you lose a lot of period colour that way. Martijn Padding’s Second Piece and Third Piece are unaccompanied works commissioned by van Rijen. There are plenty of extended techniques here, glissandos, growling etc. The composer is clearly aware of the arresting effect of van Rijen’s muscular upper register and uses it for a number of loud passages to good effect. Third Piece makes extensive wah-wah use of a harmon mute, and comes over quite jazzy as a result. I was like WOW! is an interesting finale. It belongs to that specific sub-genre of crossover where electronic effects developed for dance music are employed in electro-acoustic classical environments (other names to look out for are Roque Rivas and Stefan Klaverdal). So we have audio samples from interviews with American soldiers about the injuries they sustained in Iraq, a multitracked trombone line, and some heavy ominous bassbox accompaniment. The trombone line(s) often mimic the formants of the spoken voice, which creates a coherency in the timbral array. On the other hand, the concept behind the piece never really becomes clear, and when the voice samples are looped and slowed down, the result seems indulgent and manipulative. I’d call the work experimental, in the sense that there is obviously a great deal of potential in the technology for meaningful interaction between the classical and the electronic (composer JacobTV describes his work as ‘avant-pop’), but too many ideas are thrown in to create anything artistically meaningful. The disc includes a video to accompany the work (are they hoping for a slot on MTV?) but it adds nothing. A disappointment, then from the last track, but as far as the rest of the programme goes, I can honestly say, I was like WOW!